I still remember the excitement of my first sewing course. It was a Knitwit course that my mother gave to me to encourage me to sew. It worked! I made a jumper that first lesson and I havne't really stopped sewing since. When disaster struck being able to not only mend, but make our clothes was a Godsend. Every time I fixed a hem or made a pair of PJs or trousers for the boys I thanked Mum for her gift. Since then I have enjoyed collecting sewing hints to save time and money. 1. Before discarding pants, cut off the belt loops and use to sew on the inside of children's coats and jackets for a coat loop. No more fallen coats at school. If they are worn below the knee, cut them off and turn them into shorts. 2. Before sewing on buttons, tape each one where it belongs with a strip of sticky tape. After the first stitches are made you can remove the tape. 3. To avoid pinholes when hemming delicate garments, mark the hemline with tailor's chalk and use paper or bulldog clips to hold the fold in place. 4. Prevent future errors in sewing by slipping a memo into individual patterns explaining any size alterations or changes for that item. 5. Prevent fraying by reinforcing the hems with a row of zigzag stitching in a matching or contrasting color. 6. Sew a large button on each end of the drawstring on children's PJs. This will keep the string from disappearing. I use buttons from overcoats because they are not only big, but often very beautiful. I find them in op shops and garage sales. When I find buttons I love I buy them and add the to the button jar. 7. Keep a spool of clear nylon thread on hand. Because it is transparent it will pick up the colour of the fabric. This will also work when a bobbin runs out and the spool is almost empty; just put the clear thread on your bobbin. 8. Place a thin sheet of foam rubber or an old mouse mat under your sewing machine's foot pedal to prevent it from sliding around when you use it on an uncarpeted surface. 9. 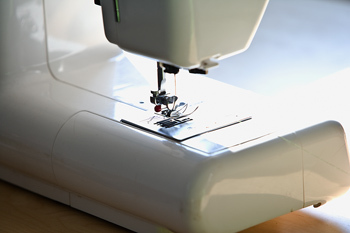 Store a magnet in your sewing basket to attract loose pins and attach one to your sewing machine to hold extra needles. If you glue a small magnet to the end of a wooden yardstick you won't have to bend over to pick up any pins that fall on the floor. 10. Thoroughly washed and cleaned mascara brushes can be used to clean the crevices of your sewing machine. 11. When letting down a garment hem you can diminish the crease by applying white vinegar to the wrong side of the fabric and steam pressing it. It really works and is especially good for school trousers and tunics and jeans. 12. Try this economical substitute for custom-cut table pads: Place a quilted mattress cover over your table top and trim with scissors for a custom fit. You'll have a sturdy, heat-absorbent table pad to protect the finish of your table from cutting, pinning and your sewing machine. 13. For a substitute needle threader: push the needle through a sheet of white paper, the eye will be easier to see. 14. When shopping for accessories for a recent sewing project, staple a small fabric sample to an index card and carry it with you to the stores. You won't have to eyeball colours, getting an exact match will be a breeze. 15. To organize loose buttons: String them on twist ties and twist the ends together for an easy way to store them. I then put them into an old jam jar I keep just for buttons. As a person who sews almost every day, I appreciated the tips. However tip 9 is not correct. Magnets are a big no-no when it comes to the electronic computer sewing machines. Magnets can ruin the machines,especially when attached to them. Keep magnets well away from sewing machines - especially the big magnets! I don't have a computer in my Janome sewing machine - it's a bit of a dinosaur at 25 years old but it still does everything the new machines do and it has the advantage of being easily cleaned and serviced by myself and cheaply repaired if necessary. Tip 9 is then only partially incorrect - keep the magnet off your computer aided sewing machine. I wonder though if magnets are such a no-no how the magnetic seam guides work on computerised sewing machines? I think that the magnetic seam guides are okay to use so long as they aren't right up against the electronics part, but yes, I agree that keeping magnets right away from the electronics part is a good idea. I also drive a Janome - just recently updated from the 30 something year old but not to a computerised version and I selected it for similar reasons. I like your tips and have another to add. I have boys and a husband who are all tall and relatively hard on pants. When I cut off winter school pants to rehem as shorts after the knees have gone or the length is more capri style than long, I keep at least one leg bottom to use as patching or backing for holes or thinning areas. My mother and grandmother also did this and it means that you have the same fabric ready to use but not so much that it becomes a storage problem. I have also saved pieces of the nylon from old spray jackets which can be useful to make semi-weather proof bags or linings. Well you've brought back memories Jenni :) I used to do the same thing with the "capri" style school pants and keep the cut-offs for patching. I also used the cut-offs to put patches inside the knees of new pants to reinforce them. By the time I was cutting them off the fabric was beautifully soft so it didn't irritate them at all. If I'd been able to get away with it I'd have put patches on the outsides of the jumper elbows too but the school wouldn't allow it. I used old sports pants to reinforce the knees of the new ones too.